The past few years, the purple product craze has really hit salons. As more and more clients crave highlights and lighter colors, the need for products that balance their tone has greatly increased. As a stylist, it is imperative to educate your color clients about the proper salon and home-care routines to banish brass. At the top of that list is Keune’s Silver Savior Shampoo and Conditioner – a purple shampoo and conditioner system that works to neutralize undesired yellow and brassy tones, which explains the point of purple! Need a refresher about color theory? We got you! A color wheel is a tool every artist learns about whether you are a stylist, makeup artist or work in the fine arts. Colors next to each other on the wheel are analogous. They are more natural pairs and often pleasing to the eye when paired together. Colors across from each other on the wheel are complementary. When mixed together will cancel each other out, creating a neutral tone. Understanding color theory and the way that complementary colors cancel each other out is one of the building blocks of formulating color. For example: if your client is a level 4 brunette and wants highlights lifted to level 7 or higher, their hair will naturally turn brassy first. There we go with the “b” word, brassy! The reason their hair turns brassy is because the underlying pigments in brunette hair are orange and red. Brassiness in hair is inevitable – it is not necessarily the question of why it happens, but when. If hair is not lifted light enough to reach blonde, it will turn brassy. That does not mean that every brunette client needs to be blonde. What this means is that you need to pay attention to the way you formulate your color, lift it, and the products and home-care you use after the process. If you already know that your client will pull extremely brassy, formulate your color to include a touch of green, blue. If creating highlights, after lifting, be sure to tone with a gloss that has a predominantly green, blue, or violet undertone depending on the result desired. Be careful to not overdo this as it can create an overly “ashy” or gray looking result. At the shampoo bowl, be sure to use Keune Silver Savior Shampoo and Conditioner on your clients. You can even apply Ultimate Blonde Neutralizing Spray for an added kick of purple to banish the brass. Inform your clients about the steps you are taking to rid their hair of unwanted tones and ask them to come in between color appointments for this service. Altering your formula to combat the brass is the first step toward a neutralized tone. Next is everything that comes after. Regardless of the shade, taking care of color treated hair is important. When it comes to brass-prone hair it is imperative! Using a purple shampoo and conditioner system will aid in neutralizing unwanted tones daily. This is exactly why we created the Keune Silver Savior Shampoo and Conditioner! Formulated with five essential minerals, it promotes healthy hair with a balanced tone. 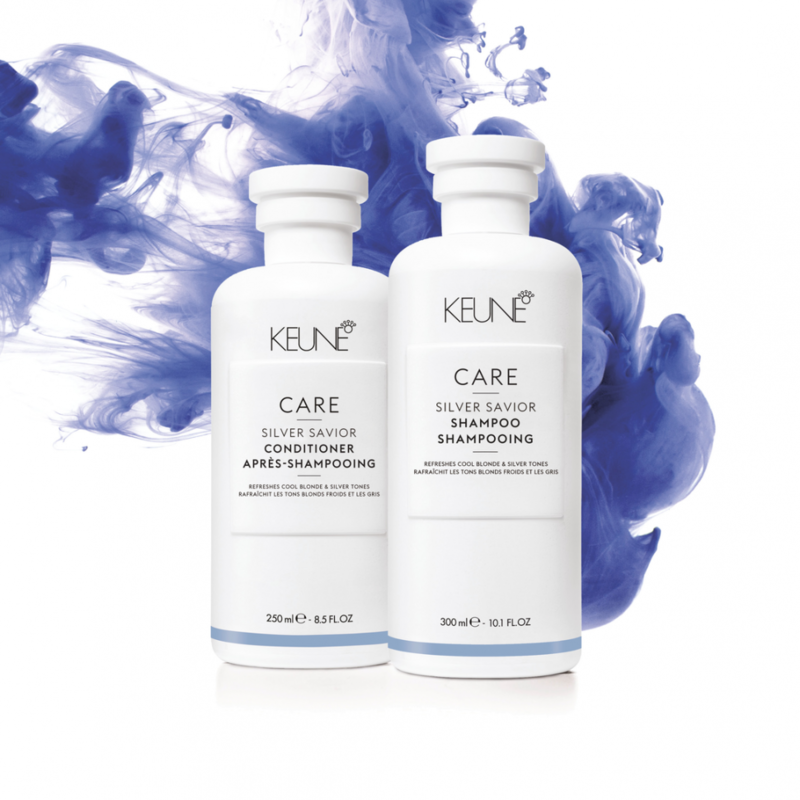 Now, for a limited time, Keune is offering 51% Savings on Silver Savior Shampoo and Conditioner liters! Be sure to contact your distributor today!